MedTech Radar Live 2019: Application submission for start-ups is now open! The German Medical Technology Association (BVMed), venture capitalist Earlybird, insurer BARMER, High-Tech Gründerfonds (HTGF), NRW.Bank and the medical technology magazine Medtech Zwo are organizing the second medtech start-up pitch. 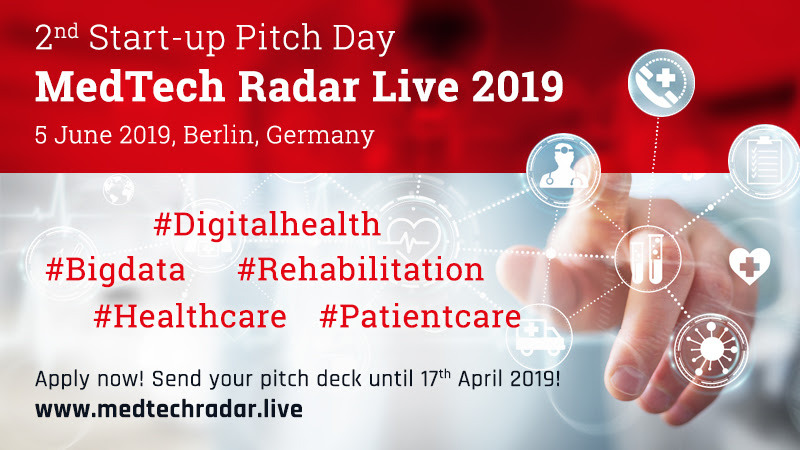 The pitch is part of the “MedTech Radar Live 2019” conference, which takes place on 5th June 2019 in Berlin and brings young med-tech founders together with representatives of the medical technology industry and potential investors. Industry representatives will discuss the challenges of developing new medical technology solutions, innovations through start-ups and new cooperation models in healthcare. The conference organizers expect around 150 participants.